Politicians are gearing up for the elections to the European Parliament in May, with candidates vying for seats in the European Union’s elected assembly. However, many students are unaware of the fact that career opportunities with the EU Commission, the European Parliament, the European Council, the European Court of Justice or the EU’s various Committees are open to university graduates every year. 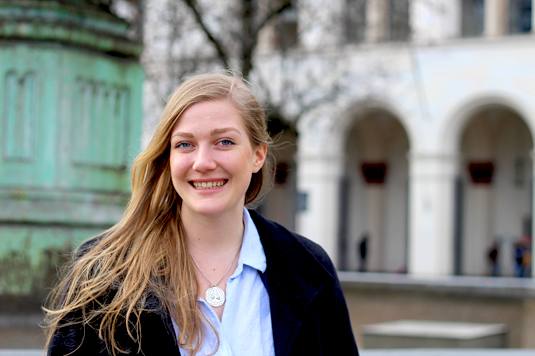 LMU Master’s student Cornelia Nissen (26) is an Ambassador for EU Careers, whose job is to ensure that her fellow know about these challenging jobs and how to apply for them. She is fired with enthusiasm for the EU, she says – and it’s not hard to understand why. Cornelia’s enthusiasm for the European project is of long standing. She grew up in North Germany, close to the border with Denmark, and she vividly remembers her parents having to present their passports to the customs officials every time the family crossed in either direction. Border controls at the German-Danish frontier were abolished only when the Schengen Agreement came into force in 2001. The EU’s motto, “United in Diversity”, encapsulates Cornelia‘s image of Europe very well. Of course, Europeans differ from one another in many ways, she says, but they share a set of common values, including their European identity. Cornelia herself has participated in school exchanges, has held internships abroad and spent a year in Copenhagen as an Erasmus exchange student. “I took every chance I could get to visit other countries,” she says. So she was already primed when she heard of the EU Careers Ambassador program at LMU. 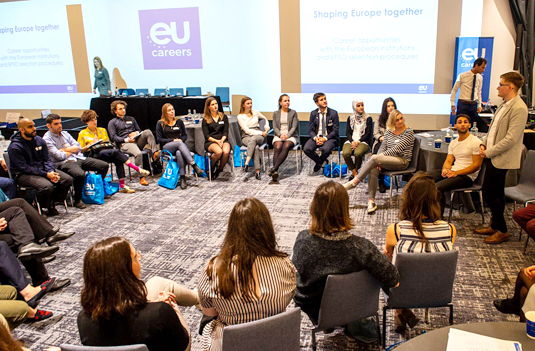 EU Careers Ambassadors are recruited from all Member States by the European Personnel Selection Office (EPSO), and their task is to keep their fellow-students informed about the career opportunities offered by the European Union. The initiative was conceived by the EPSO in 2010, and there are now 150 Ambassadors at work at over 100 participating universities. This year, 17 Ambassadors have been appointed in Germany – the largest number ever. The successful applicants from all over Europe learned what the job entails at an introductory weekend training course in Brussels. Since then, Cornelia has given talks on EU careers, led workshops for job applicants, visited career fairs, hosted presentations given by invited speakers from Brussels, and has been active on social media. She also maintains close contacts with the EU’s various liaison offices in Munich – such as Europe Direct, the citizens’ advisory bureau located in the Gasteig Cultural Center. In addition, she regularly attends the meetings of Careers Ambassadors in Germany, which are held twice a year. “Our aim is to encourage more Germans in all academic fields to work for the EU,” Cornelia explains. This is somewhat surprising, given that many Member States are prone to complaining about a perceived German dominance in the EU’s administration in Brussels. “It is true that Germany is now well represented at the higher administrative levels,” she says. The problem is that many of these officials will soon retire. Furthermore, it is not generally appreciated that the EU not only needs talented legal specialists and economists, but is also looking for scientists, linguists, generalists and psychologists. The EPSO is responsible for the preselection of applicants for EU posts. It organizes and oversees the competitions (referred to as concours) that determine which applicants are admitted to the pool of candidates from which permanent posts in the EU’s institutions are filled as they fall vacant. These tests are notoriously competitive, as there are often more than 100 applicants for a single spot in the reserve pool. “The concours is challenging, but it’s not impossible,” says Cornelia. And candidates who fail to make the cut the first time can try again, without detriment to their chances. “In fact, there are many EU officials who succeeded only after several attempts,” she avers with a smile. Moreover, other types of post are available, apart from that of the career civil servant. And here Cornelia points out that a permanent post with the EU does not mean that one spends one’s entire professional life in a single area of administration. The EU makes it possible for officials to switch from one department to another by providing training opportunities that are often not available elsewhere. It soon becomes obvious that Cornelia is a highly motivated Careers Ambassador, and takes her responsibilities very seriously. “The EU fires me up, and I want to communicate this enthusiasm to others,” she says. Although she is in the final semester of her Master‘s degree course in Political Science, is taking an advanced course in Environmental Studies at the Rachel Carson Center, works as a tutor, and has a part-time job with Allianz Investment Management, she nevertheless finds the time to visit the remotest corners of Bavaria in her capacity as EU Careers Ambassador. “One can always find the time, as long as one is convinced of the value of what one does,” she says. She obtained her Bachelor‘s degree from the University of Cologne, and during her time there she also did voluntary work as a member of the team that ran the international students’ organization AIESEC. Her specialty was advising other students who wanted to go abroad. “I enjoyed it immensely, finding out where they wanted to go, and then working out how they could best go about getting there,” she says. She loves “working her way” into new subjects and settings, she adds, having made her way from Germany’s Far North to Munich. By the way, her Bachelor’s project in Cologne dealt with the relative efficiency of various forms of taxation.